Docuware 6.7 now allows the web users to sort and display the data columns in the order they want them. everyone can have different results lists. It is up to them to decide what their world looks like. 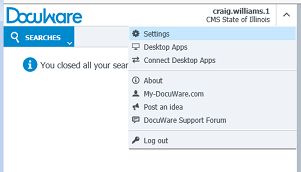 On the left side of the browser is the DOCUWARE screen, there is a big blue DOCUWARE in the upper left corner of this screen. POKE the Eye closed this will place a DO NOT ENTER sign over the eye and gray it out. You can drag and drop these in any order you choose. Closed ones go to the bottom of the list. You didn't want to see them anyway. Under RESULTS LISTS find the RESULTS you want to change. Next to it there will be a PLUS SIGN. CLICK the PLUS sign and this EXPANDS the tree for you to work with. Select the field you want by hovering your mouse over the field. It will turn light blue. Click once then CLICK a second time DRAG and DROP the item anywhere onto the list you want to move it. Perhaps there is data you do not want to see. To hide fields you do not want to see, poke the eye on the right and it will GRAYOUT and not be shown. When you poke them the move to the BOTTOM of the list automatically so they are not cluttering the list. When you are done SCROLL to the VERY Bottom of this popup and click on SAVE and CLOSE. Now when you search for items the results should appear the way you set them.